Whew, C.J. Redwine is brutal. I am not sure if she has a secret vendetta for her characters, or simply likes torturing them. (If so, we need to get the woman a plate of cookies- stat!). The characters in Deception are put through the wringer. No that sounds too placid. They were pwned. No, not strong enough..... they had a really really really bad - year? Disease, poison, savage attacks, explosions, fires, and I can't forget- dragons. Man, I am so glad I am not them! 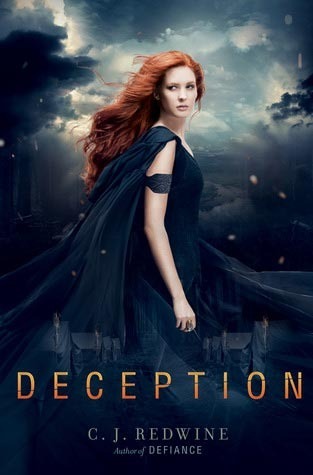 Deception picks up a few weeks (or months?) after the first book ends. Things are starting to form some semblance of order and leadership has been created. Logan has created a way for the Baalbodens who are left to essentially sneak out of town without the Commander finding them. This begins a great chase that lasts the entire book. There isn't much romance in this book. (Which was a little sad consider how romantic the first book was.) This book is harsher, meaner, and more desperate. Rachel and Logan are both emotionally scarred. Logan falls into the role of leader and devotes all of his time and attention on his inventions and trying to lead the group. Rachel is taking the events from book one very hard. She has chosen to follow the route of, "it is better to feel nothing than to give into my grief." I am actually stunned by how beautiful that cover is! I'm judging a book by its cover and I want it!